my Adafruit motorshield is getting current from Arduino board even after disconnected from battery. I was planning to give separate dc power from 6 AA cells to motor shield but not sure if extra current will enter into Arduino and damage it. I have Ultrasonic sensor connected to motorshield which is getting +5v from board (may be Arduino). The manual indicates that it is intended that the MS electronics may be operated by the Arduino power supply while using a separate external supply for the motor. Pages 37 to 39 explain about powering options. The Arduino and the shield interconnect all of : 3V, 5V, Vin. 3V may not be used by the shield. Arduino Vin to MS V+ is broken by jumper "PWRJMP" - purple rectangle in diagram below. 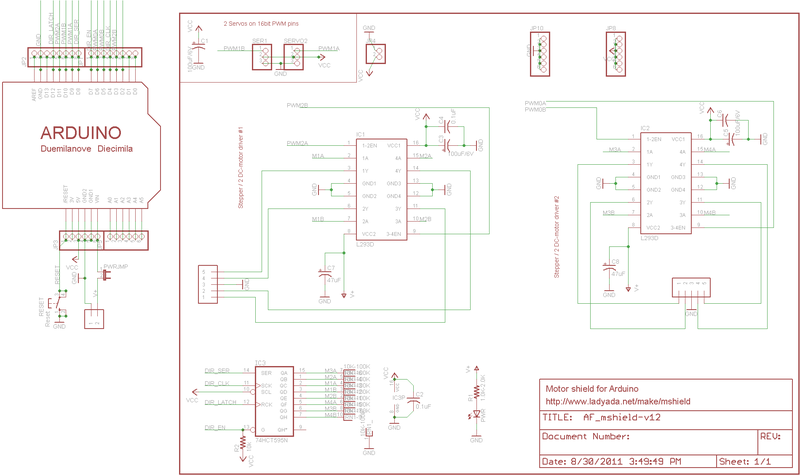 Arduino 5V to MS Vcc is not interrupted by a jumper - See labels in red squares below. You did not say what version shield you had or which Arduino or what you mean by "disconnected from battery" or supply any links to relevant documents. ALL of these things will help people to help you better. adafruit motor shield v1.2 - discontinued. 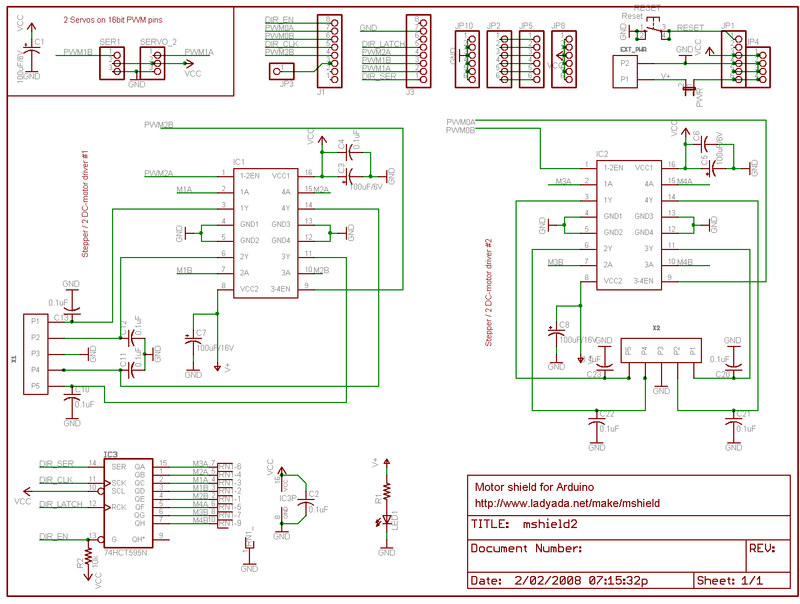 github v1.2 schematic this appears to be pre V2 BUT is linked to from a ference in the V2 manual so is probably "more or less correct". The DC motors are powered off of a 'high voltage supply' and NOT the regulated 5V. Don't connect the motor power supply to the 5V line. This is a very very very bad idea unless you are sure you know what you're doing! Not the answer you're looking for? Browse other questions tagged arduino-motor-shield adafruit or ask your own question.